Last week the Asian Human Rights Commission reported the incident of the torture of a well-known interior decorator, Mr. Madawala Maddumage Don Aruna Nilupul Indika (39), of Mahagedara, Devala Road, Welipenna in the Kalutara District, by several police officers of the Mataguma Police Station. The officer who played the most active role in Nilupul’s arrest and torture was Raveendra Pushapakumara of the Crime Branch of the Matugama Police. Nilupul reported the incident to all the relevant Sri Lankan authorities and it appears that an inquiry into the matter is underway. Meanwhile on the June 17, 2013 the officer, Raveendra Pushapakumara, arrived at Nilupul’s house in the company of another police officer. He explained to Nilupul that he had been tortured due to the complaint made by Ms. Anoma Siriweera, an Attorney-at-Law and her husband. The officer then requested Nilupul to withdraw the complaint he had made. 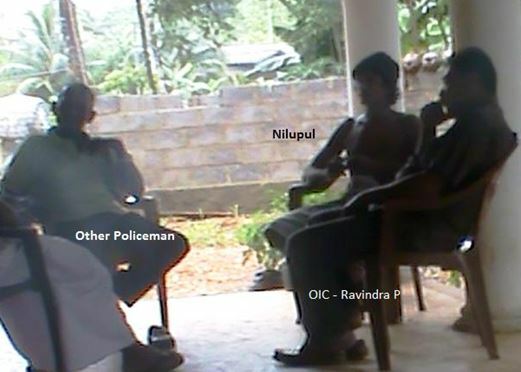 The photograph shown above shows the police officers speaking with Nilupul. It was recorded by a security camera in Nilupul’s house. Nilupul has written to the Inspector General of Police and the Human Rights Commission of Sri Lanka in order to prevent such pressure being exercised on him to stop him from pursuing justice. It is almost a regular practice of police officers accused of torture and who are subjected to inquiries to bring exert pressure and even make severe threats against victims of torture who are courageous enough to make complaints. In two instances the victims were assassinated. They are those of Gerald Perera who pursued a complaint against officers of the Watalla Police Station and Sugath Nishanta Fernando who was pursuing a complaint against the Negombo Police. The Asian Human Rights Commission urges the Inspector General of Police, the National Police Commission and the government of Sri Lanka to provide immediate protection to Nilupul. Please see here the statement issued by the AHRC on the original incident and also the letter addressed by the AHRC to His Excellency, The President of Sri Lanka. The culprits Anomaly Siribiris, the Orang Utan husband and the Roundra Pakkakumara should be lathed to run on crutches. MOD is headed by a Killer, so where you can get Justice? Its a Land of Buddha. I am astonised, why he gave chairs to those police thugs. he should not entertained those vultuers, not even invite to inside the premises. Does the minister of Defence – ALL mighty MR is not aware of all these ? If one would say, that president is not well informed, is valid for a president who is new in the business only… but here, the bugger is said to have 43 years exp, and keep repeating that he is not aware of the brutal acts of police is not acceptable to anyone. ‘also the letter addressed by the AHRC to His Excellency, The President of Sri Lanka’. This ‘his excellency’ is the main culprit of jeopardizing the entire legal system in the country. He has two tongues. He is running his own private police forces and so many other cursed ‘SENAS’. there were news that Gota’s Rakna lanka office in BMICH (undergroud) is a torturing centre. Who made that Vaas Gunawardene a murderer? Wasnt it this same His Excellency. This His Excellency is playing double games big time. He thinks the International comunity is also like his foolish country men who believes his chinthanaya and his lies. This is high time to send this corrupt regime home for once and for all and prosecute every member for the regime for their Crimes, Theft, Murder, Intimidation, Extorsion, Embezzlement, Fraud, Stealing so on. Every corrupt officers must be sent behind bars for years. Every property that they have robbed must be acquired by the future governemnt. Number of pennyless paupers including the first family have become Millionaires must be investigated thoroughly. They al lshould be dealth with and duly punished. You mean His Hexalunacy Mahinda Jilmart Rajapassa, a.k.a. Hitlerpaksha, Idi Mahin?? MR has no backbone to enforce law and order to the manner any civilized democracies have done. That is what I see here. If he is a leader of the nation, he could have done that fearlessly. His power greedyness is above everything. Why cant he order Polispathi to react adequately. If District police authorties can check the malpractices of regional police stations, nothing can go wrong. There should be a system in which regional police stations are inspected reguarly. Appubaba MR has the back bone to encouraged goons, muderers, rapists and thives such as duminda, wimal. rajitha, mervyns, his brotehrs and the whole family. MR rajapassas is same as these rapists, murderers and rapists and thivies. Dont talk about back bones here. OUR LEADER IS THIEF AND HE SUPPORTS THIVES. THERE IS NO LAW AND ORDER IN SRI LANKA AND THERE IS NO SUPPORT FOR THE EDUCATED. ALL IMPORTANT DECISIONS ARE MADE BY IDIOTS. THATS WHY HAMABNTOTA BORT, MATTAL AIR PORT EDUCATE THE REST AND ENCOURAGE THIS ROGUE REGIME TO GET THROWN OUT. How many of similar incidents would not come to surface almost every day in SL ? I think as I read it since the UN resolution is passed against SL this time, I have noticed the rise all kind of crimes in the country. That means, rulers have NOT taken the UN resolution serious. That is how MR administration respect UN RESOLUTIONS. No improvement of human rights in SL, so long the current admi is there. Asian human rights organisation will have more to explain against SRILANKA in the next UNHSR session. This is sad but the reality for Srilankens today. Independent Commissions created by the 17th Amendment were made “dependent” under circumstances of threat to “defence” and “national security”. Just imagine how the outcome of investigations would be if land and police powers had been given to PCs. Sri Lanka would then be governed by politicians, military and police. Sovereignty of people ensured by the Constitution will be ……???? Budhism is a Main Culprit for this…. as they dont belive in GOD. They did this to Tamils, now turn to Sinhalese… well lets wait how far MR and MOD will react..